Beacon Press: Do Americans Shop Too Much? Do Americans Shop Too Much? 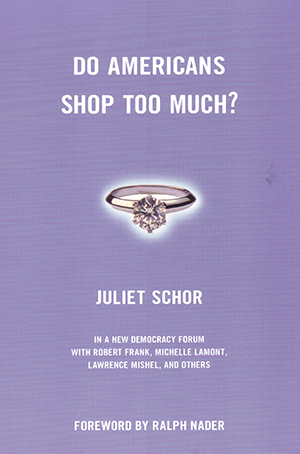 Juliet Schor breaks a taboo by exposing Americans’ shopping habits to moral society. Schor disapproves of unfettered private consumption, not only because we already use up so much, but also because overspending to bolster a sense of self does not lead to happiness. Along with her critique, Schor suggests intriguing ideas for making ’status’ goods accessible for all--for example, imposing high taxes on expensive items to subsidize lines of affordable ’luxury’ goods. A firestorm of responses follow from economist Robert Frank and others. The New Democaracy Forum is a series of short paperback originals exploring creative solutions to our most urgent national concerns. The series editors (for Boston Review), Joshua Cohen and Joel Rogers, aim to foster politically engaged, intellectually honest, and morally serious debate about fundamental issues-both on and off the agenda of conventional politics.